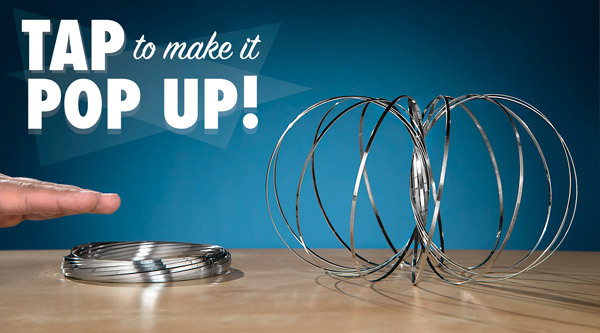 Toroflux: Slinky-like toy made from a single band of metal. Toroflux is a tactile toy made from a single strand of metal. It's somewhat like a slinky in the fourth dimension! The Toroflux's spiraling band loops back upon itself to form a torus (aka donut-like) shape, which gives it the unique ability to fully surround objects and roll around them. Roll the Toroflux down a broomstick handle, an electrical cord, and even pass it between your arms. 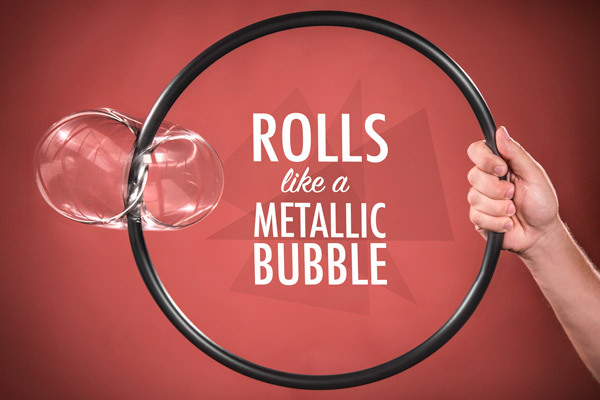 When rolling quickly, it's easy to mistake Toroflux for a metallic bubble. To the surprise of your friends and family, a flattened Toroflux will spring open when given a solid tap. Closing the Toroflux appears just as magical — simply press down on the top to flatten. 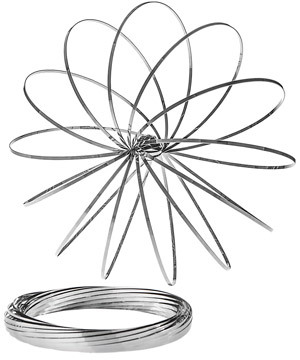 The amazing Toroflux is a deceptively simple toy made from a single strand of stainless steel. Its spiraling shape coils back upon itself giving it a set of unique properties. Tap the top of it and surprise onlookers as it springs to life. 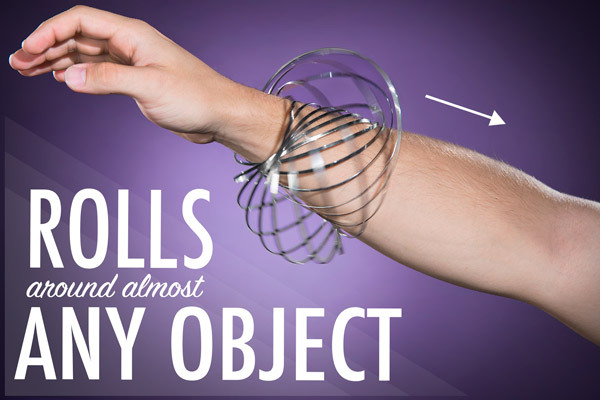 Put it around your arm, a broomstick, or any roughly cylindrical object, and Toroflux will roll around it. Smack the top of the coiled Toroflux and it jumps to life. Toroflux is made from a single strip of stainless steel which has been carefully coiled into a torus-like shape. Toroflux is made from a carefully coiled single strand of stainless steel. The Toroflux band loops back upon itself creating a donut hole in the center. Stick your arm through the center of the coiled Toroflux, tilt, and enjoy the magic metallic bubble show. Passing the Toroflux between your arms is fun, but to enjoy maximum speed, you'll need something a bit longer. The handle of a mop, broom, or shovel will work quite well. And for infinite flow, splice a hula hoop and thread it into the center of Toroflux. As it picks up speed, it looks like a crazy metallic bubble. Use a hula hoop, broomstick, or electrical cord to create a track for your rolling Toroflux. To magically return the Toroflux to its flattened state, simply press down on the top. You'll find it quite addictive to pop it up and smash it back down repeatedly. 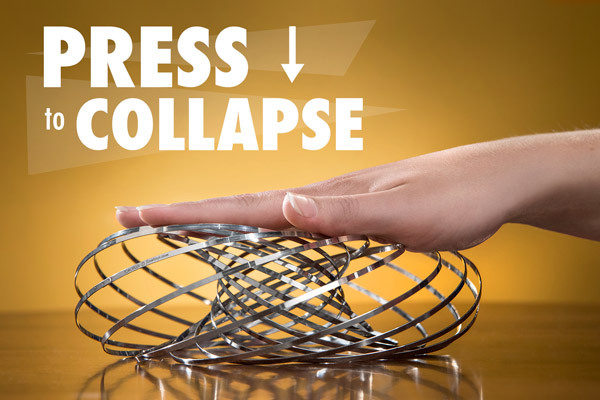 Simply lay your hand across the top of the Toroflux, and press downward to flatten it back to its coil shape. Question: What is its utility? What purpose does it serve? Answer: It provides precisely one unit of fun. Question: How sturdy is it? Will it bend easily? Answer: Treat the Toroflux with kindness and it will last a lifetime. 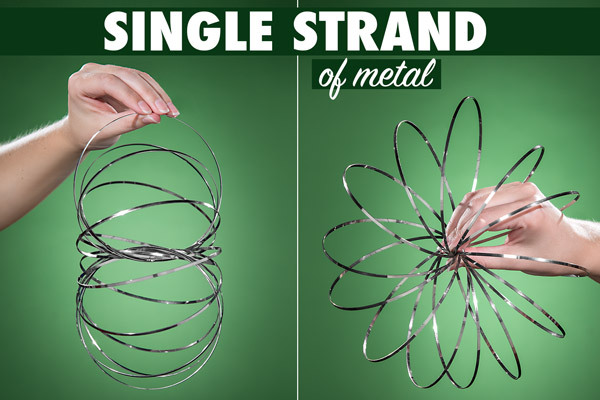 The metal strands can be bent or damaged if used too roughly. While Toroflux is made from stainless steel, the strands themselves must be relatively thin in order to coil properly. Question: Will it snag my skin or hair? Answer: Nope! Jamie has played with Toroflux far too much and he has sufficiently hairy arms. He is still snag-free. Question: Can Toroflux walk down stairs like a Slinky? Answer: Nope! Toroflux is similar to a Slinky, but it'd be boring if Toroflux duplicated all of Slinky's functionality. The bottom line is that you need both because they're both awesome! Sorry! We're sold out until April 30. More stock arriving on April 30, 2019.